No matter where you choose to sit, relax knowing that there is a lamp that can shine a light from any angle. 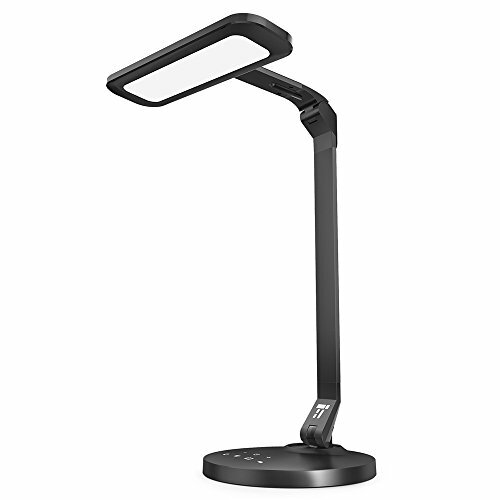 Introducing the TaoTronics TT-DL27 LED Desk Lamp, our most adjustable desk lamp yet. With a lamp head that can swivel left and right by 270° or rotate by almost 180°, to the lamp neck and arm that can be bended by 125° and 90° respectively, you're guaranteed to get that perfect angle wherever you sit. Enjoy four different types of light modes that include sleep, relax, reading, and studying. For each activity, the lamp has an optimized light best suited to accompany you. If you are the type to read under the light, hold down the power button until the mode icons flash to activate the 1 hour timer. After an hour the light will switch off - ideal if you usually fall asleep when reading. Whereas other desk lamps lack sturdiness and can even break when handled, our desk lamp features a more solid design to ensure a longer lifespan. We've done this by crafting a metal neck to ensure that the lamp never breaks. Even the base is sturdy and stable so the lamp doesn't topple over and cause any damage. If your smartphone is low on power, simply hook it up to the 5V/1A USB charging port found on the lamp. You'll discover in the morning that it charged throughout the night giving your phone a full battery for the busy day ahead.